Wilson Advance, 5 March 1880. “Disorderly conduct” was often a catch-all charge directed at many types of behavior deemed unruly, but not dangerous. Wilson Advance, 23 July 1880. On 3 May 1875, in Wilson, Alexander Harris, 40, married Fanny Moody, 25. In the 1880 census of Wilson, Wilson County: on Pettigrew Street, Virginia-born Fannie Moody, 35, “keeping house” with sons William, 11, and John, 8. In the 1920 census of Washington, District of Columbia: at 1032 Whittingham Place, paper hanger William Moody, 48; wife Sarah, 44; son Augustus, 26, hotel waiter; widowed daughter Christiana, 24; her children Lorine, 5, Robert W., 3, and Earl, 18 months; William’s mother Fanny Harris, 75; and lodger Hattie Carter, 12. Mother Ward has departed this life. Mittie’s twin, Appie Ward Hagans, perhaps 1880s. On 12 July 1866, Sarah Ward and Sam Darden filed their cohabitation in Wilson County. This registration, which formalized the marriages of ex-slaves, noted that they had been married five years, well after the births of Sarah’s children. 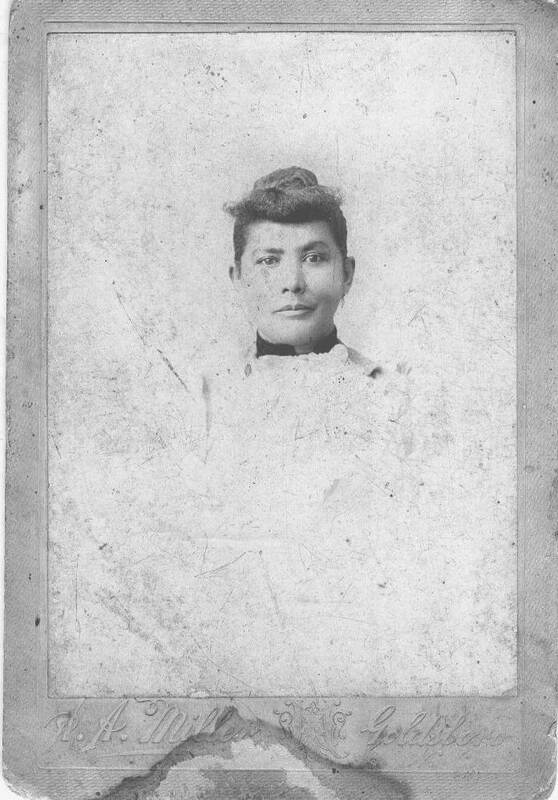 Daughter Appie married Napoleon Hagans of Nahunta, Wayne County, circa 1867, and on 16 June 1870, Henry Ward, son of D.G.W. Ward and Sarah Darden, married Sarah Forbes, daughter of Henry Forbes, in Wilson. The couple appear next door to the Forbes family in the 1870 census of Wilson. 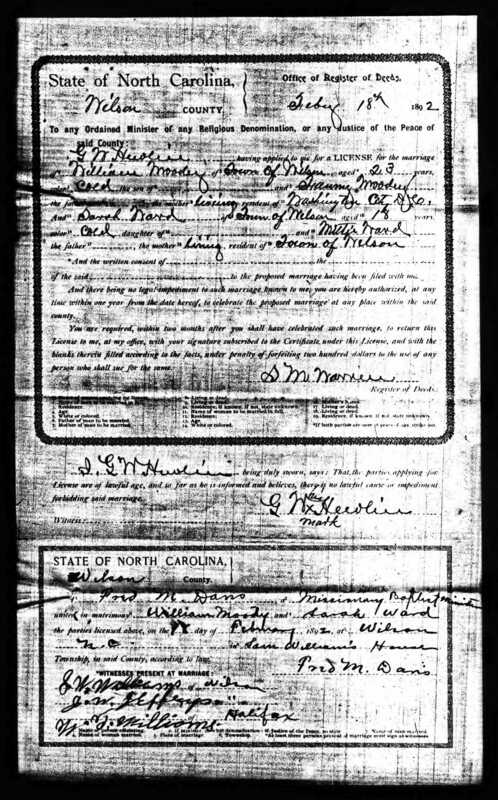 On 6 May 1879, Mitty Finch [alias Mittie Ward] married Virginia-born Algernon Vaughn in Wilson. In the 1880 census of Wilson, Wilson County: Sarah Darden, 57, son-in-law Algia Vaughn, 23, daughter Mittie, 22, and grandchildren Joseph, 8, Sarah, 6, and Macinda Vaughn, 5 months. [Joseph “Vaughn” was actually Joseph Ward, listed with his stepfather’s surname.] Also living in Wilson, plow shop worker Henry Ward, 27, wife Sarah, 28, and children Walter, 9, Manora, 7, Lilly, 5, Claudius, 3, and Addie, 1. Mittie’s daughter Sarah married William Moody in Wilson on 18 February 1892. Before the decade was out, the entire family relocated to Washington DC to join William’s mother, Fannie. In the 1900 census of the District: William Moody (born 1872), wife Sarah S. (1876) and children Augustus (June 1894) and Crist Moody (1896), plus sister-in-law Minerva Vaughn (1890), mother-in-law Mittie Vaughn (1854), and mother Fannie Harris (1854), all born in North Carolina. It was during one of her visits with her daughter Sarah Moody in Washington, D.C., that Mittie Ward succumbed to a stroke.